Guys. I was having the worst reading slump. I kept starting books and couldn't get into anything. Wandering around my branch of the New York Public Library, I found this slim little volume in the recently returned section. You might remember that I'm a huge fan of "Brown Girl Dreaming," so I brought this home. It was just what I needed to break my slump! Frannie is an 11-year-old girl living in a racially segregated area in the early 1970's. She knows what it's like to be the new kid from her own experience, and knows what it's like being stared at thanks to her deaf older brother. When a new, apparently white kid arrives in her all-black school, she is both fascinated and sympathetic to his difficult situation, particularly after her classmates name him Jesus Boy. As she grapples with her own reaction to his arrival, and those of her classmates, Frannie ponders the meaning of hope, inspired by an Emily Dickinson poem. 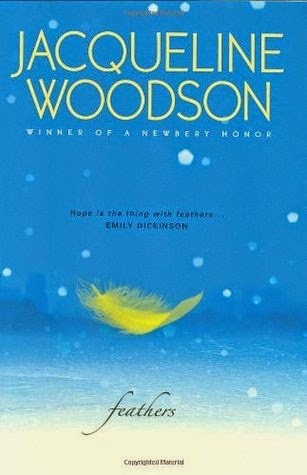 In a mere 118 pages, Woodson addresses faith, difference, adversity, and, above all, hope. For a book, never mind a children's book, I was impressed with both how much it covers thematically, and how much was left open to the reader's interpretation. She examines how religion can mean different things to different people, how children (and all people, really) handle differences among themselves, and what it means to face down adversity. As Frannie figures out what hope means to her, the reader is encouraged to think on the topic for themselves, without being at all heavy-handed. The themes are deftly interwoven in the way that faith, hope, adversity, and difference often intermingle in real life. Verdict: Affirmed. This tiny children's novel had me thinking more deeply than much of the literary fiction I've been picking up. It's all the more skillful for doing so effortlessly through beautiful prose. "Feathers" by Jacqueline Woodson, published on March 1st, 2007 by Putnam Juvenile.